When the bullets start flying on October 26, shmup fans will be too busy dodging and shooting to appreciate how pretty DoDonPachi Maximum looks on the iPhone and iPad. Thank goodness for screenshots. 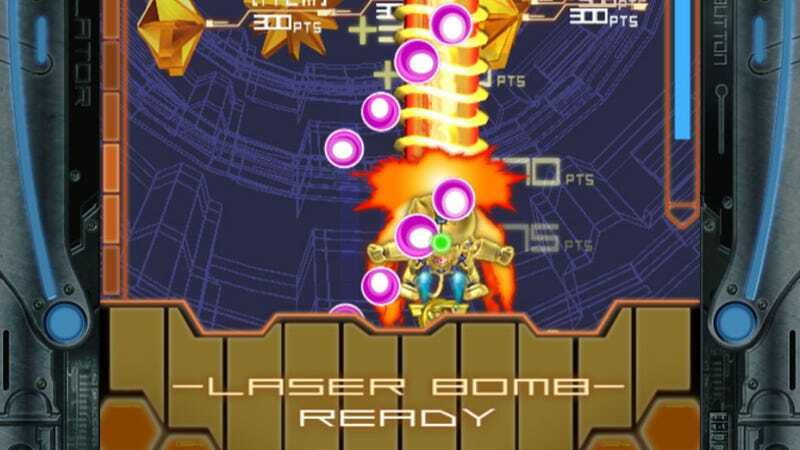 Shoot-em up master Cave is bringing this fresh new take on DoDonPachi to iOS devices later this week. Riffing on previous games DoDonPachi: Blissful Death and DoDonpachi: Resurrection, Maximum sees players testing out the EVAC Industry M.B.S. — Maximum Bullet Simulator. The iOS version features an easy mode for... well, for most everyone, and plenty of unlockable ships, including the incredibly compelling-sounding MX-07 marauding cat robot (Uoratou). Just look at those clean lines, those bright colors. No really, look at them — come October 26 you won't have time.